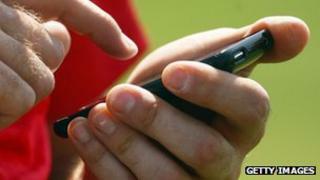 UK mobile users will be able to send and receive money by sharing only their phone number by spring 2014, the Payments Council has said. Account owners will be asked by their banks if they want to opt-in to a database that will allow the sending of money by text message. The scheme is being backed by eight major financial institutions. Its launch will bring the UK up to speed with technology long in use in the developing world. Many African nations use systems such as M-Pesa, typically seen as a secure way to transfer funds quickly between individuals and businesses. A spokesman for the Payments Council told the BBC it had taken the UK longer to catch up due to the technical challenge of building and testing a new database to power the system. Mobiles in the UK are already being used for a variety of online banking tasks, with services such as Barclay's PingIt simplifying sending money to and from accounts. But this new set-up will be the first to not require users to set-up a separate account with a mobile wallet service. Account holders who do not wish to have their details in the database will be able to refuse - only customers who opt-in will be signed up. The scheme will be administered by the Faster Payments service - which processed more than 800 million online and phone banking transactions in 2012 - and the Link network, which processed 3.1 billion cash machine withdrawals last year. The system will mean people can send and receive money to others by sharing just their mobile number - rather than having to swap other details such as sort code or account number. However, the Payments Council said a passcode or similar security measure would ensure the system could not be abused. Also, banks will have the ability to remotely disable accounts suspected of misuse. The Payments Council told the BBC that limits regarding how much money could be transferred with the service would be put in place, but that the amount had not yet been decided. Research would be conducted to make sure the limit represented a blend of "convenience and security", the spokesman added. The Payments Council said it was working on getting the remaining financial institutions who are not yet involved in the project on board.